Mature Moggies Week: What is old? It’s Mature Moggies Week (13-17 November), a chance to celebrate all the senior kitizens snoozing in their forever homes or waiting patiently in Cats Protection’s care for a new owner to give them the love they deserve. Older cats take four times longer to home than their younger counterparts, but when exactly does a cat become ‘old’? 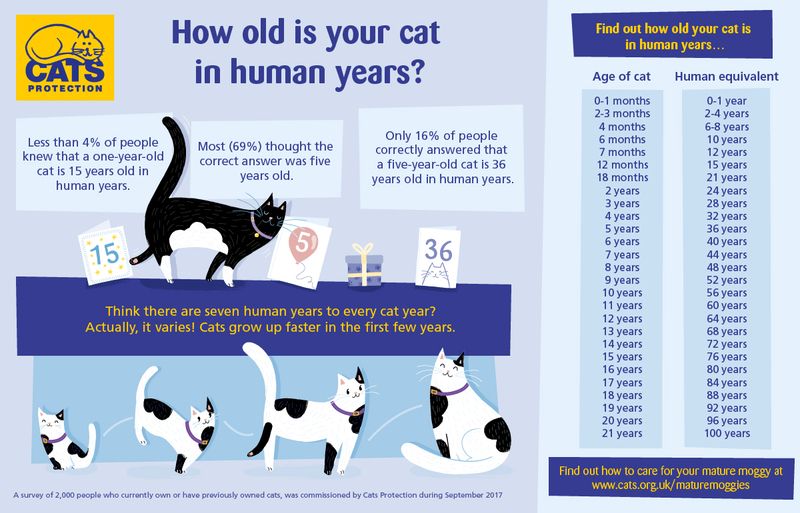 A survey conducted by Cats Protection revealed that a lot of people are confused by what actually is ‘old’ for a cat and what their equivalent age is in human years. For example, 23% of people said that they would consider any cat aged over five years as ‘older’, but only 16% of people correctly guessed that a five-year-old cat is actually only 36 in human years. Less than 4% of people knew that a one-year-old cat is 15 years old in human years, as most thought the correct answer was five years old. This confusion perhaps comes from the fact that there aren’t always seven human years to every cat year. The number actually varies, as cats grow up faster in the first few years. To find out what care your cat needs at their current stage in life, take the Mature Moggies quiz on the Cats Protection website. Simply input your cat’s age and we will give you some advice on how best to care for them. If you’re the proud owner of a senior kitizen, show the world just how amazing they are by leaving a comment below or sharing your photos and stories on Facebook, Twitter and Instagram using #MatureMoggies. Mature Moggies Week: Adopt an older cat! Why do cats go crazy for catnip?